What an overwhelming week this has been! Hopefully it’s the start of something extraordinary. On Friday, July 14th, our second daughter, Nicole, was born. 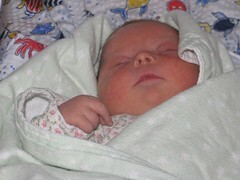 Five hours after she arrived, we learned that she had several characteristics of Down Syndrome. This was a shock, especially under the fog of sleep deprivation. Now, five days later, the initial round of testing indicates that she does have the condition. There’s nothing easy about this, especially given everything else that’s going on in our lives, but it is less of a shock because we’ve had time to come to terms with how it will change our lives. Leaving family and friends behind in Toronto at this time seems even more difficult, given the new circumstances. Fortunately we’re going to a place (New York City) where we hope to find incredible services and support. All of this got me thinking. Most people want an ordinary life speckled with extraordinary moments that make life memorable. It is very rare that life takes on an extraordinary turn of events that makes every day meaningful. Anyway, we want to share this news with those of you reading this site. We are fine. We have much learning to do, and more importantly much living. The National Down Syndrome Congress also has published some great facts that put all of this in perspective. There is also a great piece that Nicole’s aunt Angela found called, “If People with Down Syndrome Ruled the World.” If you have time, it’s worth the read. We will keep you posted as our life becomes a little bit more extraordinary. Wow! Just when I thought you couldn’t get any wiser, stronger, or more loving than you are now, here comes someone who will just take those qualities to new heights. Congratulations on your new little sweetheart! Nicole ius lucky – you guys are well equiped to handle any challenges that lie ahead – We wish you all the Best !! Congratulations on the birth of your beautiful daughter. Nicole is certainly lucky to have parents as thoughtfilled and loving as the two of you. You have the ability to make all thiings “extra ordinary”. Marley looks like she fits the big sister role just perfectly. Nothing like sisters! All our love and support. Heartfelt congratulations on the birth of your precious daughter Nicole. You truly have been given an awesome responsibility as parents and I couldnâ€™t think of two people more suited for the job. Life asks special things of special people. All the best to you as you prepare for your move and for life with this extraordinary little girl. Congratuations on your most wonderful new gift Nicole! You are very lucky indeed. Not only do already have this little angel, Marley to love and learn from but now you have been blessed with a second little angel who will give you even more gifts. They are very lucky little girls to have such extraordinary parents to love them. You never know what life will throw at you but it can make you strong and bring wonderous things your way. Congratulations on daughter #2!!! She is beautiful, and could not have been born into a more loving and supportive family. I know that this is a very challenging time in your lives with much to adjust to, but if ever there is a couple that can make it all work, it is the two of you. Nicole is a very lucky girl to have you, Marley (and the extended clans and friendship network in place for support), and the two of you are now blessed with two beautiful daughters. Challenging, of course, but a life without challenges is a life without learning and reward. Congratulations to the growing family. Nicole looks rosy and sweet. Big sister Marley looks as proud as her parents! I am so excited to meet her and look forward to seeing all of you; it’s been too long. We can’t wait to meet little Nicole – she is so beautiful! Its sometimes the unexpected things in life that makes it worth living because we remember to keep growing and learning. AND anyway, its the two of you, so we know things will be fine! David, your post was very touching and inspiring. Life truly is extraordinary and things come our way in different ways to give it new meaning. I have definitely learned this over the years. I’m sure Nicole will play an incredible role in your upcoming adventures in NYC. Dave and Karyn, a very belated congratulations (sorry!) on the birth of your 2nd beautiful daughter! As has already been mentioned, little Nicole could not have picked a better set of parents, nor a better big sister! Congrats from the Hayles. Two beautiful girls. We send all out love and support your way. Just remember when in doubt, get some SLEEP. What a lovely family you have! Congratulations!!! I am just receiving your news today. Marley and Nicole are adorable. I look forward to seeing them in person. And New York… how exciting! I’m sure you feel overwhelmed right now but hopefully it won’t take long to adjust to your new life. I’ll send a longer note soon. I just stumbled across your blog…your baby daughter is adorable! Congrats on her birth! My daughter, Kayla, also has Down syndrome. She was born on July 15, but in 2003. Funny how our girls were almost exactly 3 yrs apart! We went to our first Buddy Walk when Kayla was almost 3 months old. Enjoy the Walk in NYC – I hear it’s amazing to attend!